Florian Neuhaus is the most valuable non-German national team player according to the German sports page Transfermarkt. Valued €24 million the 1860 Munich product, who currently plays for Borussia Mönchengladbach, currently anchors the midfield for Germany’s U-21 side that is among the favourites to win the 2019 U-21 European Championships that will take place in Italy and San Marino this summer. Experience Bundesliga football live! Book your European football travel now by visiting Nickes.com! “We have been together for over a year, and you can tell that every single one of us has made a step forward in their development — including myself,” Neuhaus told the German magazine kicker in November. “I am noticing that people have started to take note of me,” he added. “I am always excited to play for the U-21 and represent Germany at the European Championships next summer,” he concluded. That does not mean that he will not be capped for the senior team until then. Although it felt like a little resurrection when Germany defeated the Netherlands in Amsterdam 3-2 on Sunday — Joachim Löw had made significant cuts to his team, and with Toni Kroos, Manuel Neuer and Matthias Ginter had just three 2014 World Cup winners starting. In fact, both Neuer and Kroos have been singled out for potentially being axed next after Joachim Löw cut Jérôme Boateng, Thomas Müller and Mats Hummels earlier this month. Both responded by playing very well against the Netherlands prolonging their national team career. Furthermore, Kroos, in particular, is the type of midfield general seldom found in the world game and for now, is without an alternative in die Nationalmannschaft. 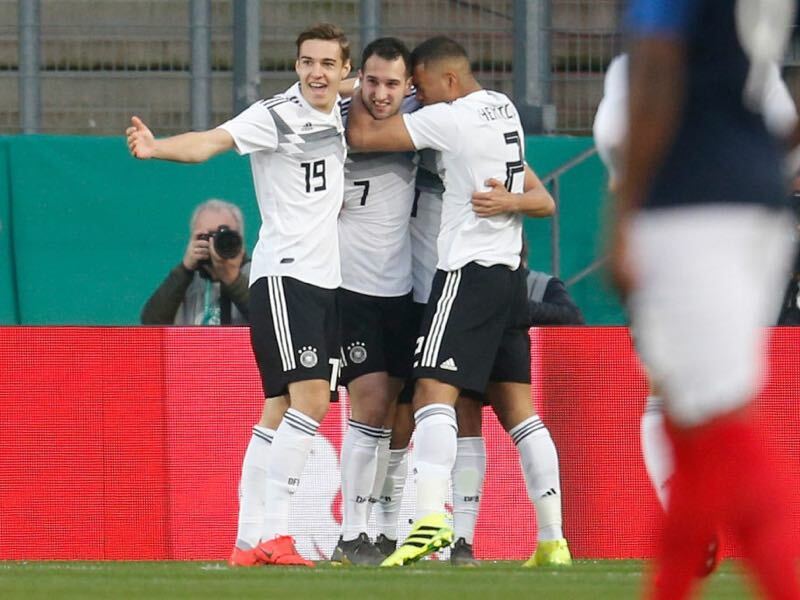 Florian Neuhaus, in the meantime, was also on international duty playing with Germany’s U-21 against France. It was a game Germany, like the senior side against the Netherlands, dominated for the first 45 minutes taking a 2-0 lead into halftime. In the second half, France came back, aided by the many changes U-21 coach Stefan Kuntz made in the side throughout the game. Like the senior side, the U-21 also started in a 3-4-1-2 formation with Florian Neuhaus playing the more defensive part in a double-pivot next to Borussia Dortmund’s Mahmoud Dahoud. Playing 63 minutes, Neuhaus managed to complete 90% of his passes and won 42% of his duels. Numbers that reflect his overall season for both club and country. 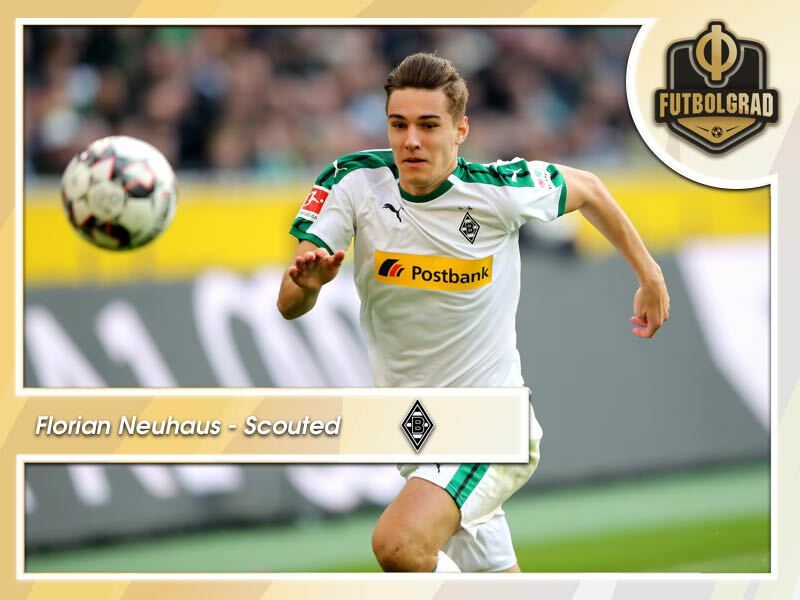 Playing for both Gladbach and Germany’s U-21 Florian Neuhaus has averaged 84.5% pass completion, managed to complete 52.6% of his on average 2.28 long passes per game and won 39.8% of his on average 17.19 duels per game. Numbers that are impressive but not quite on the level that Toni Kroos displayed this season. The 29-year-old managed to complete 98% of his 42 passes against the Netherlands on Sunday and 100% of his five long balls. Overall, this season Kroos averages a pass completion rate of 93.3% (79.41 passes per 90 minutes). Those numbers, in fact, highlight that Kroos is still one of a kind — the sort of player Spain had with Xabi Alonso, a metronome that can dictate the play. It also explains why Löw refuses to do without his midfield general. But time is a brutal factor in professional football, and while midfielders like Kroos can play longer than players in most other positions, Germany need to look ahead when it comes to the midfield position. When it comes to filling the Kroos gap, Florian Neuhaus will certainly factor into the debate. In fact, Joachim Löw is likely to call up the midfielder soon, perhaps as early as the next set of Euro 2020 qualifiers in June to give Neuhaus a taste of first-team football. Because one thing is for sure, while Germany can afford to make significant cuts in the defence and attack, where the country has plenty of depth, the story is different when it comes to Toni Kroos. Here Florian Neuhaus has a big opportunity to stake a claim. But he will not be the only one, as the likes of Julian Weigl, Mahmoud Dahoud and U-21 national team partner Arne Maier all have highlighted that they could play in that position as well.